I’ve lived in London for most of my adult life (so far) and totally feel like the city is my home. It’s a bustling, somewhat crowded city but I love its energy and attitude and the fact that there is so much to do and see. And I particularly love it in summer – well in summer when the sun comes out. Which it did this week! And what better way to spend a sunny summer evening than dining overlooking the River Thames. Bistro Vadouvan is set on Putney Wharf’s Piazza and on such a lovely evening it felt more like we were dining in Spain than England. It’s the brainchild of two friends who grew up in the same town in India but only got to know each other years later at college (weird how that does happen)! Their interesting dishes combine classic French cuisine with Middle Eastern and Asian flavours – making for some wonderful plates of food. 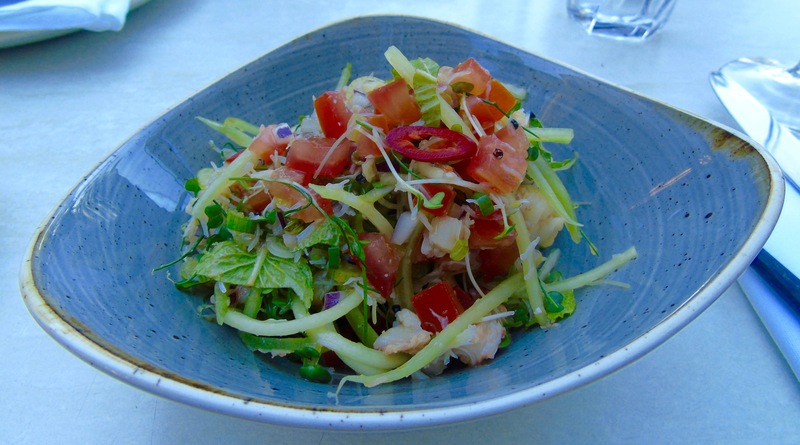 The prawn, crab and cucumber salad was served with yuzu kosho and a hint of green chilli. Yuzu is a Japanese citrus fruit and this is a simply stunning, summery dish. So light and zesty with plenty of crunch and beautifully fresh seafood. Reminded me of some of the beautiful salads I ate in Vietnam last year. And doesn’t it look amazing too. 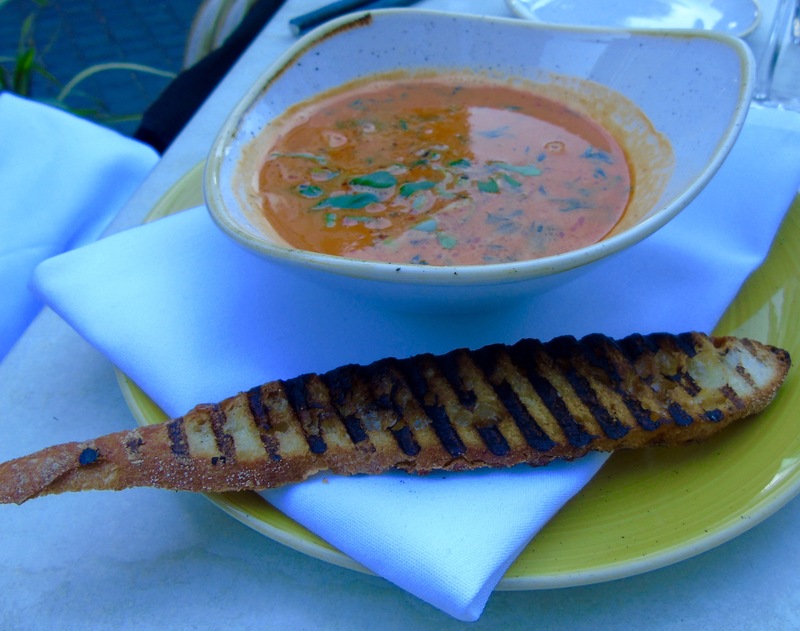 The spiced Bouillabaisse Provencal was a classic with a twist. Plump rope mussels, chorizo and Middle Eastern flavours gave the fish soup added depth. Love the fish-shaped bread, too. It seemed like it was going to be hard to follow those starter choices – two of the standout dishes of the summer so far. However, this fishy main was stupendous. 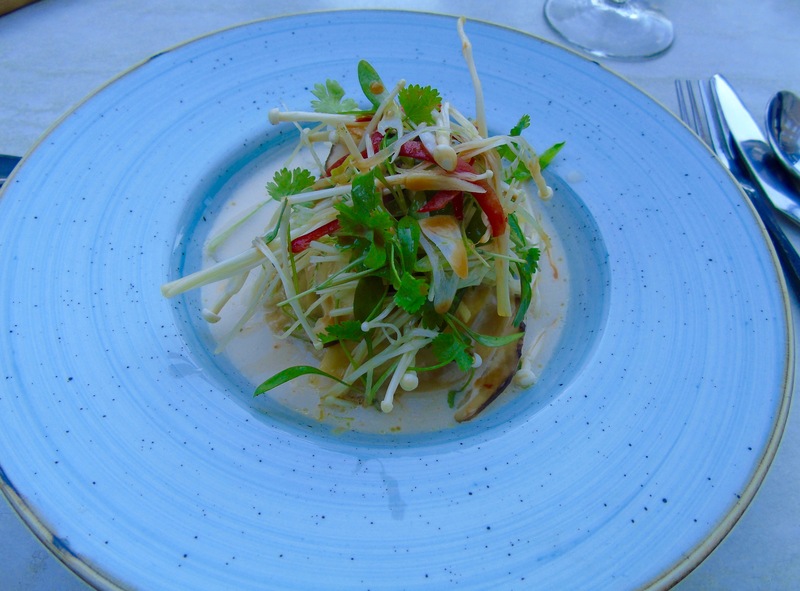 Cornish brill was poached in coconut milk and served with prawn ravioli, gnocchi, shiitake, spring onion and chilli salad. I can’t say I’ve eaten much brill – I certainly plan to in the future. It was beautifully soft and sweet, the broth was creamy and was topped with a fabulous combo of mushrooms, salad and herbs. 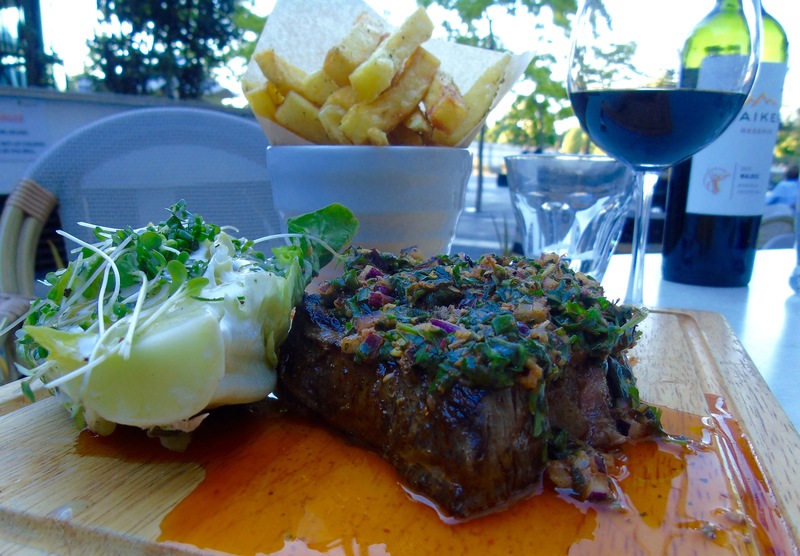 One of today’s specials was a rib eye steak topped with salsa verde. 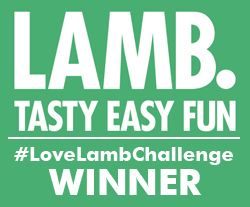 It was served with what the restaurant calls well-dressed whole baby gem lettuce topped with an incredible dressing and a bowl of perfectly crisp chips with rosemary and garlic. Bistro Vadouvan has a wonderfully intriguing list of desserts on offer, we just couldn’t resist. 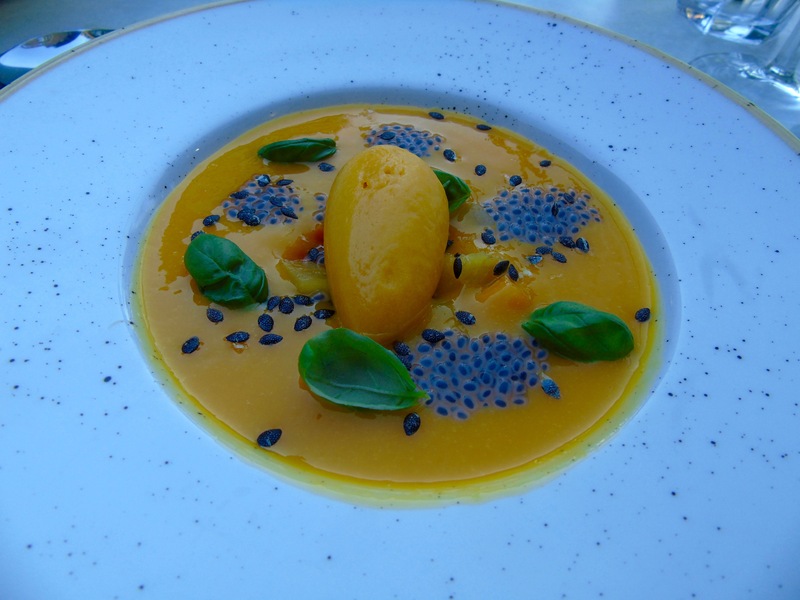 I opted for the mango soup which was served with basil leaves and seeds. A bowl of refreshing, liquid mango with luscious little chunks inside and topped with a mango sorbet. Mango and basil is a heavenly contribution and as a lover of both this is a pudding that’s right up my alley! The other delight that caught our eye was called Floating Island. 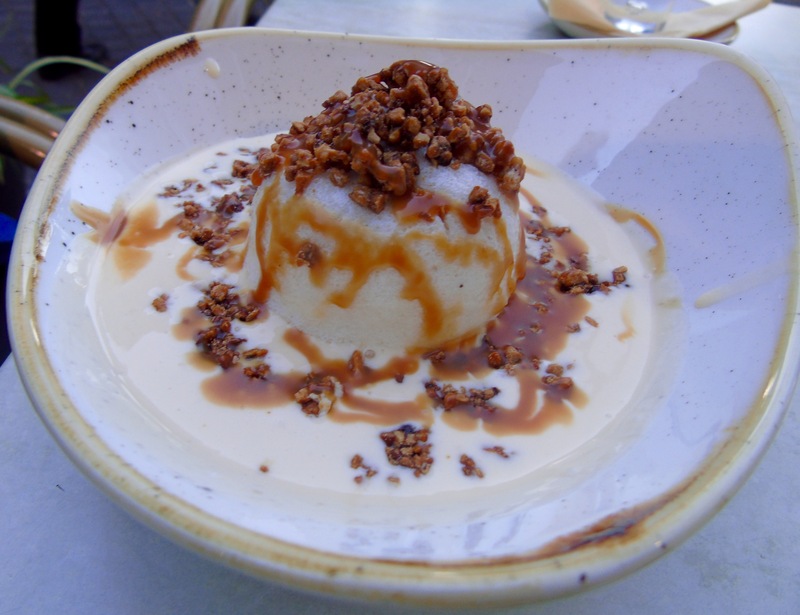 Basically a soft meringue floating in creme anglaise and topped with crunchy, caramelised nuts. Wow, what joy! We even tried combining the two and the fruity, sweet and creamy result was incredible. What wonderful summer desserts. A three course dinner for two cost £70 not including wine or service. Wine starts from around £20 a bottle. Bistro Vadouvan is at 30 Brewhouse Lane, Putney Wharf SW15 on the river near Putney Bridge.